Good for all purposes except drying. Skin color is a green ground, flushed with red stripes where not shaded, and it produces fairly late in the season (late October and beyond). The white flesh is juicy, crisp and mildly sweet with a rich, aromatic subacid flavor, noted for high vitamin C content. Its characteristic flavor is more tart than most popular varieties, and its flesh is harder/crunchier than most, with a thin skin. 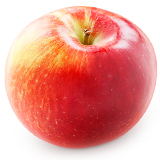 The Northern Spy apple (Malus ‘Northern Spy’), sometimes known as “Northern Spie” or “Northern Pie Apple” is a variety of apple native to the Northern East Coast of the United States and parts of Michigan and Ontario. Intriguing name, yet this apple is a professional baker’s dream! An antique apple still popular because of tart, acidic properties that cook up well in applesauce, pie and other dishes. A hard apple that ripens late and stores well. Northern Spy is well known for its winter-hardiness. It is a naturally vigorous variety which will produce a relatively large tree, however whilst it grows strongly it can take longer than most apple varieties to come into bearing, and it also has a tendency to lapse into biennial bearing.